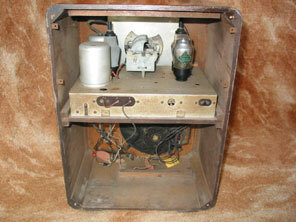 Shown above is a battery Cossor receiver model 238 from about 1937. This set was designed for the home without mains electricity, requiring HT, GB and accumulators to provide power. It can be seen that celluloid tuning scales of the early 1930s have been superseded, in this case the scale is printed onto a plate viewable through clear glass. 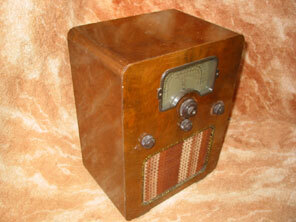 Reception is provided on long wave and medium wave. Very nice detailing is present around the perimeter of the speaker cloth, but that apart there is nothing remarkable about this receiver. Valve line-up is 210VPT, 210SPT, 220HPT, and the receiver cost £5.12.6 (without batteries).